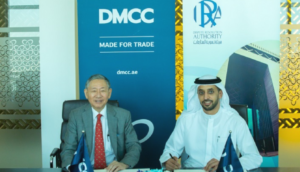 DMCC, the Government and Free Zone authority on trade, enterprise and commodities in Dubai and DIFC’s Dispute Resolution Authority (‘DRA’) have signed a Memorandum of Understanding (‘memorandum’), to further enhance bilateral trade relations. The terms of the memorandum state that the two entities will collaborate to provide DMCC member companies with access to DRA services, including DIFC Courts, which are recognised as one of the world’s leading commercial court systems. The terms of the memorandum, which strengthens ties between two of Dubai’s leading free zones, cover a range of areas of mutual benefit to DMCC and the DIFC’s Dispute Resolution Authority, including access to professional services, trade and financial infrastructure; and collaboration on events and knowledge sharing initiatives. Both the DRA and DMCC offer dispute resolution services today. The DRA operates the DIFC Courts which includes the DIFC Small Claims Tribunal (DIFC SCT) and the Dubai Arbitration Institute. DMCC operates the DMCC Disputes Centre. The two parties are now collaborating to enhance their services in terms of efficiency and access. As a result, DMCC member companies will be able to attend DIFC SCT hearings remotely from Almas Tower by video link. DMCC will be the first Free Zone to offer its members direct access to the DIFC SCT via video link. DMCC members will also benefit from access to ‘DMCC ambassadors’ within the DIFC, who will guide DMCC members through the process, if required, when bringing a claim to the DIFC SCT. This is a unique service offered by the DIFC SCT to DMCC members. The DIFC SCT process also incorporates an element of mediation. The DMCC Disputes Centre also offers a commercial mediation service. Both authorities have therefore agreed that there is no requirement to go through mediation as part of the DIFC SCT process where parties have already been through the mediation process at the DMCC Disputes Centre. Clarity: Proceedings are conducted in English which negates the need for documents to be translated. Fast Track Services: Ahead of the hearing, both parties will be given the opportunity to agree to an accelerated case plan and to decide the timing of the steps for preparation for the hearing.